Approval buttons. The buttons appear when the User is an Approver. Proceed for approval button. The approval here is via the system. Alternative paper approval button. The approval here is through signing of pdf document. During the approval process, the calculation is not possible. If the User pressed the approval button, an approval page appears. Approve buttons. If the user has rights for approval, he/she can press the button and approve the calculations. This button unlocks the calculation and stops the approval process. The process goes one-step back. With pressing the “Download PDF” button, the User downloads locally a pdf document, which he/she can sign manually or electronically. 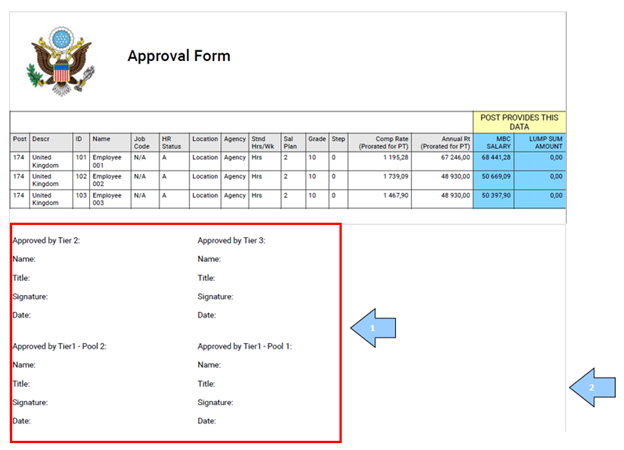 With pressing the “Upload Signed PDF” button, the User uploads the signed by him/her PDF approval document in the system. 1. Places for manual signatures. After signing, the Approver scans the document in pdf and uploads it in the system.